Personal Branding is a relatively new, but very important term. You may work for a brand right now, but you need to create your own independent brand. Who are you, what are you all about, what do you like and what are your own unique points that make you stand out. Jot down a list of these things then begin to display them across your Social Channels. You have to be smart and professional at all times so take this on board. I am big on humour but you can’t start telling jokes on LinkedIn. It doesn’t work and you will lose credibility. Facebook is more likely the place for that, so understand the platforms that you are on. Social Media has been around for some time now so unless you are at the very start of your career I would assume you have some presence. You can’t just have a static presence, you need to grow your audience and in turn become known to your peers and prospects alike. The key thing to remember in this process is trust. You want to build trust and maintain it at all times because you need this facet for people to want to do business with you. Get familiar with Social Media post frequency across platforms. As a general rule of thumb aim for 1 Linked In share per day, 1 Instagram and 4+ Twitter. This guide will provide you with more detail. I’d also recommend looking at the book, KNOWN by Mark W. Schaefer. Social Selling is / can be, a slightly longer lead time. If we think of making a cold call (on the rare chance) you get through to your prospect, things can go pretty quickly from there. There are various stages to Social Selling and it will take longer to establish yourself online then build solid relationships. Hopefully your management team are digitally / socially savvy, if not, you have some internal selling / convincing to do. This is where you need to arm yourself with stats and clearly detail your progress through touches, asks and meetings set. Do be sure to let management know that the phone is still included in this process, but it will come at a later stage. Sales and Marketing have been quoted together since time began. That said, they have always been distinctly different disciplines. This distinctive difference is beginning to blur as the modern salesperson becomes familiar with marketing principles, tools and so on. You will probably want to add content creation to your arsenal so becoming good at blogging would be advantageous, for example. Additionally, you will want to learn about the core principles of marketing and look into customer behaviours. Now that the majority of the workforce are / should be on Social Media, you need to find out where they are. There are the obvious places (LinkedIn / Twitter / Facebook / Instagram etc). But also, have a think about other places like Bebee, Pinterest, Reddit and Quora. Some buyers may just stick to one platform. I’ve seen dead LinkedIn pages before, but really active Twitter – and vice versa. Do a search for some tools that can help you see where users are at x-platform. One of the best places to find and engage with prospects is Facebook! To be more specific Facebook Groups. Two years ago, I had very little professional connections on my Facebook page (now I have around 80 ranging from managers to colleagues to peers). I don’t have any prospects on there as that would be a step too far – however, this is where Facebook Groups comes in. I run my own group (as part of my personal brand), and I am a member of multiple others. If this makes you slightly uncomfortable just make sure your privacy settings are up to date. Don’t forget to join our group. You want to get the attention of your buyers / prospects and add some genuine value. Do a bit of a brainstorm and think about all the business related content you might want to share with them. You can do this manually from a website or set up website / news platforms, but my recommendation is that you head over to Feedly to set up content feeds and share from there. Feedly also hooks up nicely to 3rd party Social Media Management platforms like it does with the platform I use – Sprout Social. This makes it super easy to share, especially by using the Chrome plugin. This could be the trickiest part of the whole process. If you are clumsy and do it all wrong, it will be noticeable and get you off to the worst possible start. Think value versus ask. Offer content, industry insights etc. Before that however, you need to begin conversation. So, a touch point could be defined as a like on a tweet or comment on a LinkedIn post. Some touches are considered more soft than others. Doing something like commenting on a LinkedIn post, then sharing it and tagging the author, is considered more substantial touch point. Worded properly, this may allow you to take the conversation in to a private one and subsequently lead to taking things offline (phonecall or meeting). Record this and add it to your metrics using your CRM, for example. Current Active Conversations – How many prospects are you having a meaningful conversation with that might take things to the next stage? Asks that you have performed – How many prospects have you asked if they’d like to move to the next stage? Agreements to take the conversation offline – Out of those asked, how many have said yes (and how many said no and why)? Appointments – From the above activity, how many sales appointments have you made. Conversions – From your sales appointments, which have those have converted to a sale. 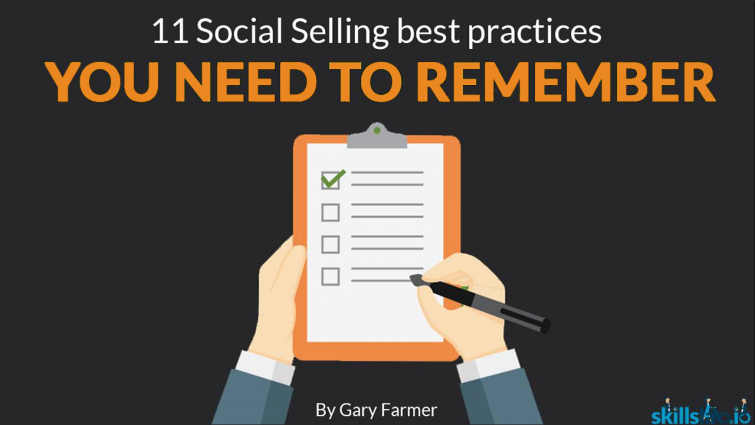 With social selling, you want to keep it just that – social. It does not need to be a robotic process. That does nothing for you, nor your buyer. Stick to the principles but be adaptable and creative in your approach! You need to keep your own knowledge up to date within your industry. There will be various ways to do this, one of which is following the leaders in your sector! Check out published lists of these and then begin following across all platforms. You could create a Twitter list for example. Locate websites that are going to keep you bang up to date too! Try Flipboard. This can keep you updated on the subject of your choice. Additionally, you can create your own magazines which in turn can be shared with your followers and/or prospects. As I mentioned at the start of the post, these best practices are built out of my own experiences. You might have things to add and if so I would be delighted for you to drop them below. I would see the above as a framework for Social Selling and if applied properly, should help you perform better in your role. and discover the secret tools that will make you more efficient.